Every hunter or shooter will admit that there are times when distance is an extremely important factor for a successful hit. Indeed, you want to give your target enough room to not suspect your presence, which is undoubtedly one of the best ways to increase your likelihood of making a kill. In this post, we are happy to introduce to you one of the most useful riflescope on the market, the Armasight Nemesis Night Vision Riflescope, which is designed purposely for long range shooting. In this review, we will explore some of the outstanding features of the Nemesis and answer some of the questions that potential buyers often ask. We hope that you will find this review helpful. 1.10.1 Q. Who are the manufacturers of Armasight Nemesis Night Vision Riflescope? 1.10.2 Q. Can the riflescope be mounted to standard Picatinny/Weaver rails? 1.10.3 Q. Does the scope have a low battery indicator? 1.10.4 Q. What colors can I purchase the Armasight Nemesis Night Vision Riflescope in? 1.10.5 Q. How many digital reticle styles does the Nemesis have? 1.10.6 Q. Does the riflescope come with a case for holding it? 1.10.7 Q. What are the colors of the reticles of the scope? 1.10.8 Q. What is the eye relief of the Nemesis? 1.10.9 Q. Does it have a low battery indicator? 1.10.10 Q. Does the device come with additional batteries? 1.10.11 Q. What is the weight of the riflescope? 1.10.12 Q. Does the riflescope come with a warranty? 1.10.13 Q. What are the dimensions of the riflescope? 1.10.14 Q. Is the scope waterproof? 1.10.15 Q. What’s the battery run time of the Nemesis? 1.10.16 Q. Does the riflescope have shock-resistant optics? 1.10.17 Q. Is this device corrosion resistant? You can now view targets at very long distances thanks to the Nemesis’ excellent 6x magnification. And in the night time, when it becomes difficult to see, this powerful magnification will help you to see extremely well by bringing all your targets in sharp focus. With the scope’s internal windage and elevation adjustment, you can now position your scope to the desired angle, with minimal difficulty. This very useful internalized windage and elevation adjustments also have the added benefit of ensuring that your positioning is accurate, unlike when you do so manually. The scope comes with a uniquely thin crosshair reticle, which is very difficult to find in other rifles in the industry. The thin crosshairs are very well defined, and help you to aim and shoot, even at extremely small targets that are far away from you. At nighttime, the crosshairs are illuminated in red color to help you aim at your target with minimal difficulty. Another neat feature of the Nemesis is its easily detachable IR Illuminator whose primary job is to give you the unique opportunity to clearly see faraway objects during the night. As daylight is reduced, the IR illuminator sets to work by emitting nearly invisible infrared rays on your target. When the target is extremely bright, it becomes easy for you to see it through the scope’s lens. The last but not least outstanding feature of the Nemesis that we shall talk about in this review is its Picatinny/Weaver mount that allows you to use the scope with almost any weapon that has a Picatinny/Weaver Rail mount. Also, weapons with Picatinny Rail mounts ensure that the scope is securely fastened to them for intense action. The scope comes with a very powerful 6x magnification. The Nemesis is engineered with a very quality Generation 2+ image night vision technology. The device is very easy to use thanks to its user-friendly controls. It comes with a very effective waterproof housing. It has adequate eye relief to prevent eye injuries from shooting. The scope has an impressively long battery life of 60 hours. The scope can be controlled remotely. It has multicoated lens that reduce unwanted reflections. The manufacturers back the Nemesis up with a two-year warranty. It doesn’t come with additional batteries or a carrying case. The scope would have been better if it came with more than one reticle style. Q. Who are the manufacturers of Armasight Nemesis Night Vision Riflescope? A. 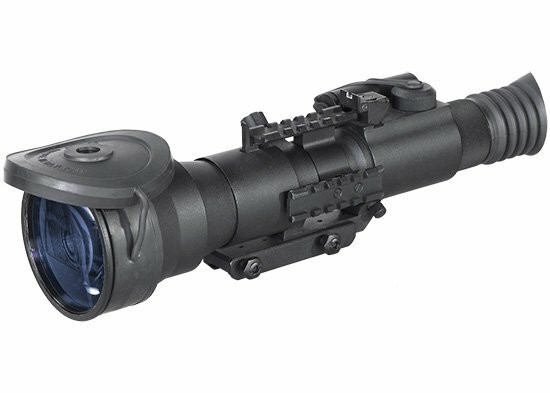 The Nemesis 6x Gen 2+ Night Vision Riflescope is manufactured by Armasight International Incorporated, which is a highly respected California-based producer and distributor of high quality night vision products, daytime optics and thermal systems. In 2016, FLIR Systems, a manufacturer of vision systems, acquired Armasight International Incorporated, making Armasight Inc. a subsidiary of FLIR Systems. Q. Can the riflescope be mounted to standard Picatinny/Weaver rails? A. Yes, the scope can be mounted to all weapons that have Picatinny/Weaver rails. Q. Does the scope have a low battery indicator? A. Yes, the Nemesis has an on-screen low battery indicator. Q. What colors can I purchase the Armasight Nemesis Night Vision Riflescope in? A. The Nemesis comes in one color, Black. Q. How many digital reticle styles does the Nemesis have? A. The scope comes with only one reticle style, Crosshair. A. No, the Nemesis doesn’t have carrying case. Q. What are the colors of the reticles of the scope? A. The scope’s reticles come in only one color, Red. Q. What is the eye relief of the Nemesis? A. It has an eye relief of 46. Q. Does it have a low battery indicator? A. Yes it does (in FOV). Q. Does the device come with additional batteries? A. No, it doesn’t have additional batteries in the pack. A. The Nemesis has an approximate weight of 4.2lbs. A. Yes, the riflescope comes with a 2-year limited warranty. A. The riflescope measures 15.3x4x2.8inches. Q. Is the scope waterproof? Q. What’s the battery run time of the Nemesis? A. The scope’s battery run time is 60 hours. Q. Does the riflescope have shock-resistant optics? A. Yes, the Nemesis comes with shock-protected optics. Q. Is this device corrosion resistant? A. Yes. The Nemesis is made with an aircraft aluminum housing, which is corrosion resistant. The Nemesis is widely praised as one of the best rated riflescopes out there, and rightly so. It has many good features such as illuminated reticle, the renowned Generation 2+ night vision technology, IR illuminator, simplified internal windage and elevation adjustment, user-friendly controls, 6x magnification, and Picatinny/Weaver rail mounts, which all come together to make it one of the most useful scopes for hunting during the day and in darkness. The combined effects of the many good attributes of the Nemesis mentioned above provide accuracy at a long distance and perfect vision at night. If you are therefore a hunter looking to improve the accuracy of your shots during night hunting trips, then Armasight Nemesis could be an ideal choice for you!